Becoming a member of the Khushi Crew is a really easy way to get involved with Khushi Feet by supporting the charity on a regular basis. 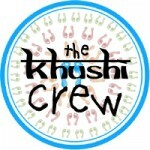 Khushi Crew members will be the first to know about any special events or promotions that Khushi Feet are running! How to become a member of the Khushi Crew: Visit our online giving page and set up the appropriate monthly donation using the secure online payment service. You have the option to ‘send the charity a message’ during checkout. Just send us a message with your email address when you set up your monthly donation and we will add you to the Khushi Crew. Please add Gift Aid to your donation if you are a UK taxpayer and don’t forget your email address! Monthly giving is such a simple way of doing what you can to make a difference. So…what are you waiting for? Become a member of the Khushi Crew today.